Returning from a pastoral visit, my heart felt weary, my soul heavy. Turning into our driveway though, I saw my 6 year old in his bright yellow batman pyjamas hovering at the front door waiting for me, a big smile on his face. Oh the joy! The sight was pure joy and balm to the soul. It made me think of the Scripture “The joy of the Lord is your strength” (Nehemiah 8:10). That evening I had caught just a glimpse of what joy does. The healing side to it. How much more then does the joy of the Lord give us strength. Because of its supernatural origin, the joy of the Lord—our gladness of heart—is present even through the trials of life. We abide in Christ and we have access to a joy that means in the hard times we can sing, in the trials we can praise. Our spirit stirs us, joy arises and we are strengthened. Before the age of GPS, before the time when man-made satellites joined the stars in the sky as tools for navigation, sailors sailed the sea guided by the stars – celestial navigation. They used the position of the fixed stars as their guide. The stars were their constant in the changing seas. God is our constant. He is steadfast and unchanging. No matter what we have to face each day, or what uncertainties lie ahead, God is there with His mercy and His love. As constant as the Northern Star is our God. 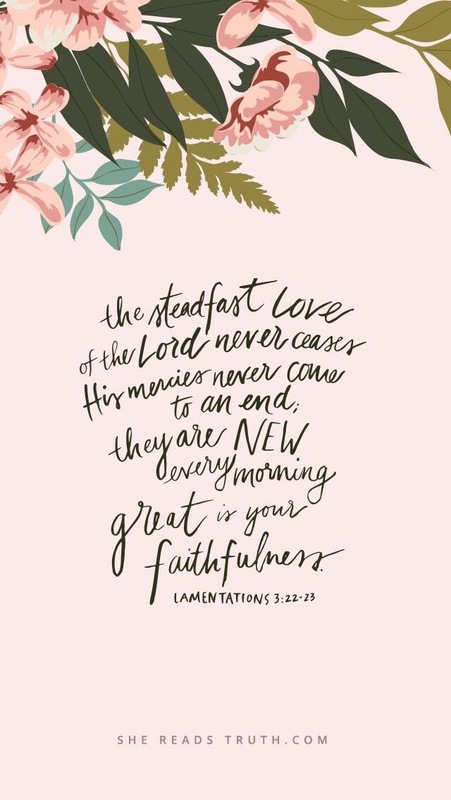 There to guide us, love us and bring new mercies and grace into every new day. It’s the day after Valentine’s Day. Just an ordinary day. No floral shops overflowing with red roses, or advertisements of what to give someone you love. No pink and red helium balloons in malls. Yesterday would have been an easier day to write on. It would be appropriate to write about the Greatest Love story ever told when the world is celebrating love. To write about the love story that surpasses Romeo and Juliet, Antony and Cleopatra. This love that is spectacular and audacious. This love story is of God whose love for us knows no end. And He would demonstrate this love it with an amazing, intricate plan of a baby, of a Son and of sacrifice. When I think about it though, this love story is best told on the ordinary days. For it’s the ordinary days that this love is experienced. That as we go through our normal days this extraordinary love of God for us is there, always there. And if we pay attention, in our ordinary days there are demonstrations and signs of this love everywhere. For God is always celebrating His love for us. It’s funny how some days time can just seem to vanish. One minute you’re well ahead of schedule and then suddenly the time is gone – as if into a vortex or you’ve entered a parallel universe where you’re late! Time – it’s such a precious commodity. A limited to 24 hours a day commodity! Life coaches and experts have many tips on how to make the most of your time. To be more efficient at work, at home. To make every minute count! But it’s true, there are moments in our day for our taking. Across our days we have small slices of time – maybe just 5 minutes here or there where we can take a breather, grab a coffee even! These are moments too where we can turn our hearts towards God, to pause and be aware of His presence in our lives. It’s how we keep the conversation going with God long after our quiet time is over. Trust without borders. Dare we? Dare we remove the limits to our faith? Those safeguards that lie at our faith’s edge? Dare we declare to God for Him to take us deeper than before? We all have those borders – those places of security. Our health, relationships, our financial provision, our job security, our reputation, our identity. Without borders is putting that on the line. It is saying I will trust you to what you call me to, to what ever happens, I will trust. It sounds scary to live a life without limits. But actually trusting in God is what makes us appear brave on the outside. It’s when we choose to ignore what our circumstances are telling us. It’s when despite the reality around us we choose to step out of the boat to what God has called us to. We choose to trust Him. To seek Him in the deepest waters, to seek Him in the mystery . It means that there is nothing that will halt our faith. Nothing that puts limits on our trust in God. My 8 year old wrote this poem. A great description of a playground. A great description of life! In life we all have circumstances that pull us down rather like the slides. We have seasons for progress, of moving forward or upward like climbing up ladders. And sometimes we have those busy seasons in life that leave you…well…dizzy! We read in Ecclesiastes that “there is a time for everything, and a season for every activity under the heavens.” In life there is change. As much as a child goes from a swing to a slide, we move through different seasons. Seasons that welcome new babies into the family, seasons of change on the work front. Seasons of rest and seasons of pouring out. Friends gained and friends lost. Good seasons, hard seasons, joyful seasons. It is my prayer that whatever the season we walk through it with God, with His grace, strength and wisdom.